How do I UPDATE from a SELECT in SQL Server? Without a WHERE clause, you'll affect even rows that don't need to be affected, which could (possibly) cause index recalculation or fire triggers that really shouldn't have been fired. Another possibility not mentioned yet is to just chuck the SELECT statement itself into a CTE and then update the CTE. This has the benefit that it is easy to run the SELECT statement on its own first to sanity check the results, but it does requires you to alias the columns as above if they are named the same in source and target tables. This also has the same limitation as the proprietary UPDATE ... FROM syntax shown in four of the other answers. If the source table is on the many side of a one-to-many join then it is undeterministic which of the possible matching joined records will be used in the Update (an issue that MERGE avoids by raising an error if there is an attempt to update the same row more than once). This may be a niche reason to perform an update (for example, mainly used in a procedure), or may be obvious to others, but it should also be stated that you can perform an update-select statement without using join (in case the tables you're updating between have no common field). It checks if it is null or not by using "WHERE EXIST". I add this only so you can see a quick way to write it so that you can check what will be updated before doing the update. Since there are too many replies of this post, which are most heavily up-voted, I thought I would provide my suggestion here too. Although the question is very interesting, I have seen in many forum sites and made a solution using INNER JOIN with screenshots. At first, I have created a table named with schoolold and inserted few records with respect to their column names and execute it. Then I executed SELECT command to view inserted records. 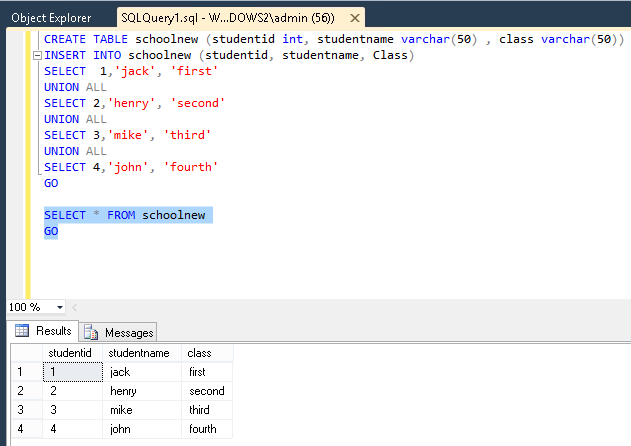 Then I created a new table named with schoolnew and similarly executed above actions on it. Then, to view inserted records in it, I execute SELECT command. Now, Here I want to make some changes in third and fourth row, to complete this action, I execute UPDATE command with INNER JOIN. To view the changes I execute the SELECT command. 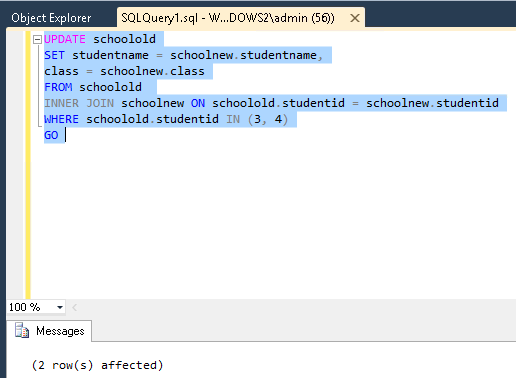 You can see how Third and Fourth records of table schoolold easily replaced with table schoolnew by using INNER JOIN with UPDATE statement. What I usually do is putting everything in a roll backed transaction and using the "OUTPUT": in this way I see everything that is about to happen. When I am happy with what I see, I change the ROLLBACK into COMMIT. Consolidating all the different approaches here. Sample table structure is below and will update from Product_BAK to Product table. Not the answer you're looking for? Browse other questions tagged sql sql-server tsql select or ask your own question. How do I perform an IF…THEN in an SQL SELECT? 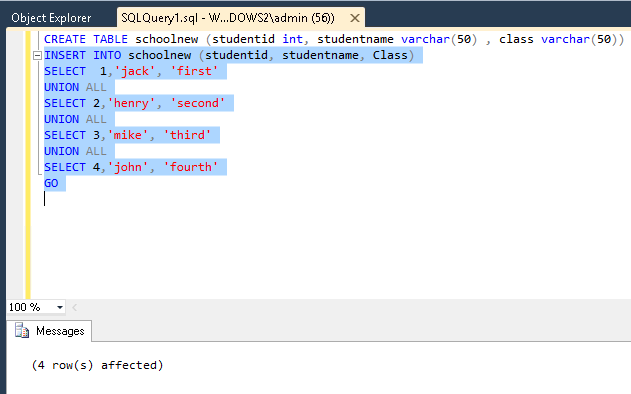 How to check if a column exists in a SQL Server table? 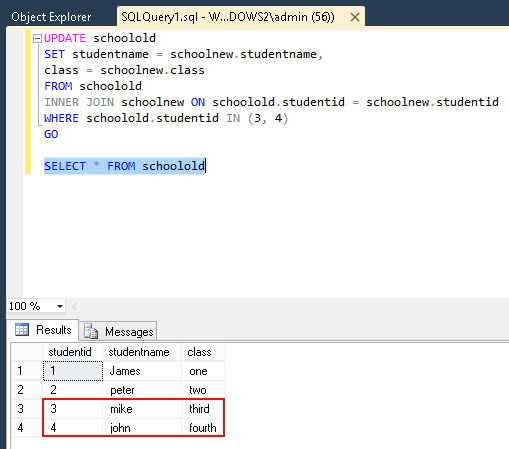 How to concatenate text from multiple rows into a single text string in SQL server? Inserting multiple rows in a single SQL query? How can I do an UPDATE statement with JOIN in SQL? Can stored/leased 737s be used to substitute for grounded MAXs? Is it possible to intall libXft.so.2 on WSL? What could prevent concentrated local exploration? How to show a density matrix is in a pure/mixed state? Combining list in a Cartesian product format with addition operation? How do I say "this must not happen"? Can anyone explain what's the meaning of this in the new Game of Thrones opening animations? How to get a flat-head nail out of a piece of wood? Import keychain to clean macOS install?